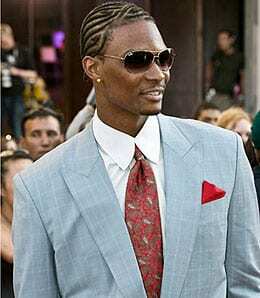 Chris Bosh looks sharp in a suit, but is no longer the go-to man on his team. It’s late-September, so with baseball season winding down, and our NHL Draft Kit almost wrapped, today we officially launch the 2010-11 RotoRob NBA Draft Kit. Over the next few weeks, we’ll bring you a bevy of cheat sheets, sleepers, busts and rookies to watch this coming season. So while you wonder if the Nuggets will move Carmelo Anthony before the season starts, let’s take a look at ten players (in no particular order) that we are avoiding (or at least not reaching for) on draft day.